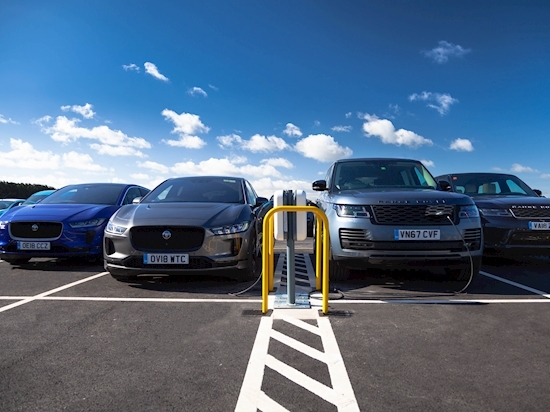 Jaguar Land Rover has opened what it calls the ‘UK’s largest’ EV charging facility at one of its sites. Consisting of 166 outlets, the facility has been opened at the firm’s engineering centre in Gaydon, Warwick, and is available to all JLR employees. The outlets are part of the NewMotion charging network, operated by oil giants Shell. It means Jaguar Land Rover employees will also be able to use one card to access other publicly available charging points across Europe — as well as monitoring their vehicle’s battery via a smartphone application. Visitors to JLR’s Gaydon site will also be able to take advantage of the facility. As all charging stations are 7kW AC outlets, JLR claims an all-electric I-Pace can receive an extra 22 miles of range per hour — and receive 176 miles’ worth of charge during a regular eight-hour working day. Currently, Jaguar Land Rover offers just one all-electric vehicle in the form of its I-Pace SUV, while plug-in hybrid variants of the Range Rover and Range Rover Sport are available too.